At this point, Black will normally choose between the solid connection a or the hanging connection b to complete the attach and draw back joseki. Before doing so, he can also play elsewhere, in a way that he can take White's answer into account and adapt his decision regarding a and b. Known such probes are the approach moves at the circled points. This is the standard pattern. The attach and draw back joseki ends at , but immediately pressures the extension and is honte. Overall, there is a somewhat submissive feel to this opening for Black. If White plays at , Black will play and . If Black had followed the joseki before playing at , White would have played at the marked point, aiming at the invasion point a. This does not mean that playing the joseki without exchanging for before is worse than playing (it was played in numerous professional games). Black is just a way to resist White's plan. If White plays the large low extension, Black plays this variation of the joseki and, again, is not ideally placed for invading at a. This is traditional theory. However, in current pro practice Black invades the corner at b immediately, for a quite different kind of result. In a gobase search in April 2007, there are 13 games following this diagram, and 42 with the invasion. There are three places in 21st Century Go vols. 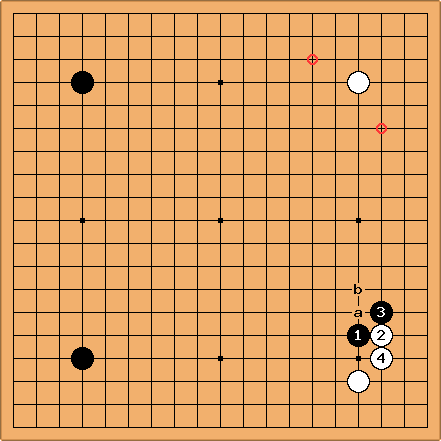 3 and 4 where Go Seigen comments on this fuseki. He does not like it much. Instead of , if Black plays a kakari in the bottom left, he prefers . He does not like . He thinks is on the wrong side (See next diagram). And he thinks is bad (see section "White resists and cuts"). After he thinks that Black has a winning advantage. 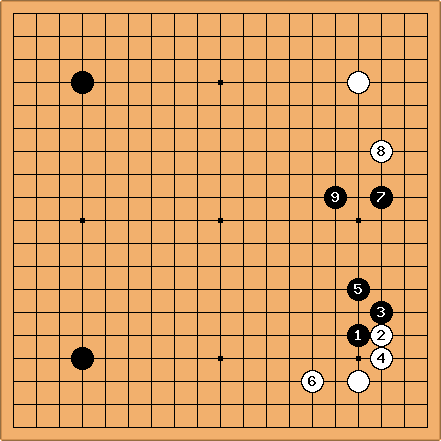 Go Seigen prefers the approach from the left side instead of the top, and gives this possible continuation. Instead of connecting in the bottom left, he says, Black takes big points. 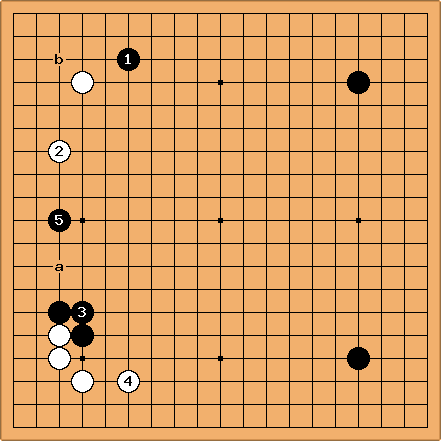 In the 17th GS Caltex Cup finals, Lee Sedol (black) played this way against Park Yeonghun. The local implications of White not responding to any of the approaches, but cutting at , are discussed at 3-4 point high approach, inside contact, tenuki variation. The global implication of resisting and cutting is that Black plays as the double kakari, and White initiates a classic joseki by playing a or b. Clearly White already has taken a significant profit in the lower left corner. But it isn't easy to win the game with just one corner territory. This is supported by a database search by Andre Engels. In his data, the position occurs 193 times, amongst which white plays some kind of answer down the upper left 121 times, pincered the black stone 20 times, plays around the middle of the left side 13 times and cuts 4 times. If we extend the search by disregarding the right half of the board, the numbers get to 405 occurences, with 323 extensions in the upper left, 45 pincers, 23 plays around the middle of the left side, 10 cuts and 4 times where white plays on the right and black gets the next move in this area.